ABT has deployed Office 365 to hundreds of Mortgage companies nationwide. We know what it takes to keep employees productive and your information secure. We deploy Office 365 using our MortgageWorkSpace portal that provides a company branded portal where users can access any app that their administrator has granted them access to. With single sign on there is only one password to remember and users can easily login to any app or website they need. For compliance we give you access to security and audit reports to make sure you know who has access to your system and what documents they have accessed or downloaded. C.F.P.B guidelines require users to change their passwords every 60 days. Office 365 mortgage enables you to deploy updated user credentials to hundreds of users with just a few clicks. Even if a password is compromised multi-factor authentication adds an additional layer of security. Work confidently on the go With Office mobile apps for Android™, Apple® and Windows devices, you get the familiar Office experience optimized for touch and smaller screens for all your devices. Enjoy consistent editing and formatting features no matter where you get things done Productivity. Office 365 can provide amazing features to make your mortgage company secure, efficient and compliant. It takes a deep understanding of the mortgage industry to install and configure office 365 across your organization. 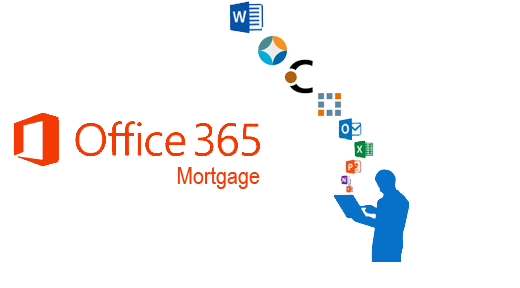 With Office 365 Mortgage you can use all of the productivity features that Office 365 but know that it's configured for maximum security. You can hire an IT company or perhaps hire your own IT department to deploy Office 365 but they may not have the specific Mortgage Industry experience to provide you with the right protection. The vast majority of Banks, Credit Unions and Mortgage Companies are still using traditional On-Premises IT infastructure. You've invested tens of thousands of dollars not to mention hundreds of man hours on your current environment. You have a system that works but you know it's just a matter of time before your business needs to utilize the vast resources of Office 365 and the Azure cloud. With our Hybrid cloud solutions you can keep all of your existing IT infrastructure while migrating a fraction of your business to the cloud. Your on premises servers are synced with your new cloud based servers. Users can authenticate to your on premises network or the your new cloud based network. You can make the transition over years not weeks. In the on-premises world, backups are standard and not just for disasters. It was possible to go back to a know point in time and recover data that was inadvertently deleted. The cloud is no different; problems and mistakes happen and data could be lost. That's why ABT is committed to providing built in redundancy and double daily backups. We also provide additional an independent archive so you are not putting all of your eggs in one basket. Office 365 cannot single handedly protect your organization from socially engineered scams, costly downtime and data loss. You need to make sure the person or company responsible for protecting your mortgage company has the experience, expertise and policies in place when deploying office 365. We use complex configurations and custom written software to make Office 365 exceed banking standards. Hackers don't care if your deployment is on-premises or in the cloud; they're still going to try and find a way into your system. Deploying Office 365 "out of the box" could expose your mortgage company to even greater risk then having an on premise system. Communicate Quicker - Connect immediately with colleagues via instant message and video conferencing for all your online meetings. Easy to Use - Get started in just minutes, and set up new users in seconds—no training needed. Endless Mobility- Get access on nearly any device so you can be productive on the go, no matter where you’re going. Secure Access - Secure, single-sign-on access to email, documents, people, and meetings. Smarter Project Management - Share and edit documents, files, and projects and collaborate with colleagues online. Work Anywhere - Get anywhere-access to your email, calendar, files and more on nearly any device and work on your Office files online or offline. incredibly rich outlook email experience with compliance components that meet and exceed the latest regulatory requirements.